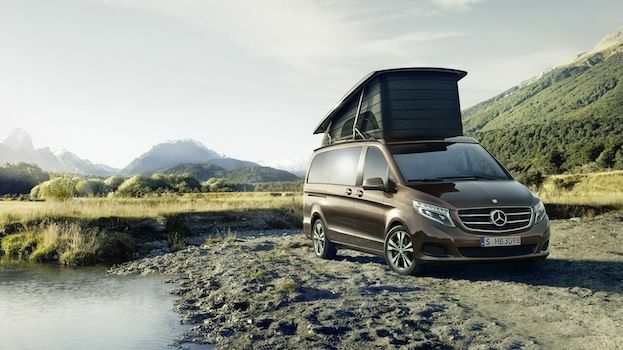 The Mercedes V-Class workhorse camper van has been given the premium treatment that would make for the ultimate road trip. Think camper van and you're mind is likely transported to the rickety old Volkswagens from the 1960s – quirky little machines that look great the front covers of beach barbeque cookery books and T-shirts from Fat Face but spend more time on the hard shoulder thanks to ancient running gear and leaky roofs. Mercedes has recently unveiled its Marco Polo camper van, a thoroughly modern machine that not only packs the craftsmanship associated with the German marque, but also boasts an interior that will make the Hilton blush. Based on the standard V-Class van, which comes with a choice of three diesel engines of varying power, the Marco Polo adds a kitchenette, wardrobes, retractable tables and enough space to sleep four people in two double beds. The transformation is courtesy of Westfalia - a German automotive company that has been converting the aforementioned VW camper vans since the 1950s. Westfalia has added an electronically raising roof, which creates added space for upstairs sleeping quarters, as well as the stylish kitchenette and 'downstairs' living area. On the ground floor, occupants can shift and slide the rear bench to create extra space for the retractable table top. Front seat passengers can swivel their chairs 180-degrees for romantic dinners courtesy of the twin-hob gas burner and, once the evening has drawn to a close, the rear seats can be electronically folded flat to create a cosy double bed. Being a Mercedes-Benz, the interior is festooned in leather upholstery, porcelain colours and wood trim but customers can also specify LED lighting and optional ambient lighting for the kitchen area. Once you've become tired of the guy in the campsite who insists on strumming the same Jack Johnson songs on his acoustic guitar, you can pack away the comfortable ensemble at the press of a few buttons. On the open road, drivers are treated to the typical array of Mercedes tech, including Active Parking for help squeezing in to tight spaces, Attention Assist to warn against drowsiness, and optional 360-degree cameras to avoid low-speed scrapes. The Mercedes-Benz Marco Polo will go on sale in Germany at the end of this month for around £45,000. Unfortunately, there are currently no plans to bring the weekend warrior to the UK, so interested parties will have to visit their local VW showroom and ask to look at the California for now. It's almost identical to the big Merc with regards to living and sleeping arrangements but it's not quite a luxurious as its German brethren.